Two analysts weighed in on Nike's recent woes, with both pointing out that Adidas is taking some of Nike's market share. Nike Inc. (NKE - Get Report) shareholders had been used to years of gains, as Nike shares continually churned higher and higher. However, the last 18 months have not been the same. Blame it on Adidas (ADDYY . Blame it on the shifting landscape of retail, as Foot Locker (FL - Get Report) and Finish Line (FINL continue to struggle. Blame it on Amazon.com, Inc. (AMZN - Get Report) and the rise of e-commerce. The truth is, it's likely a blend of all three. While Nike shares are up 5.25% in 2017, they are actually down 3% over the past 12 months and has failed to reclaim the highs it hit in late-2015. Still, it's faring better than some of its competition. For instance, Under Armour (UA - Get Report) (UAA - Get Report) is down 40% and 55% during the same periods, respectively. At one point, Nike management said it will hit $50 billion in sales by 2020. According to Susquehanna analyst Sam Poser, that outlook may be pushed back. The company will likely provide a new five-year plan, he says. 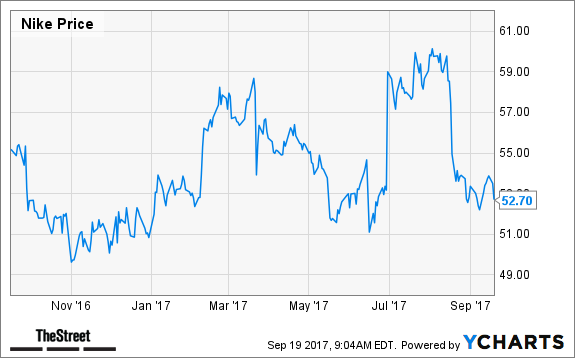 Poser downgraded the stock to neutral from positive and cut his price target to $54 from $64, a decline of nearly 16%. While noteworthy, it's also important to point out that the price target is near current levels. Nike shares closed at $53.50 Monday, but is currently trading lower by about 1.8%, to $52.50 in early Tuesday trading. Poser wasn't the only one dropping Nike, though. Jefferies analyst Randal Konik was out there, too, slashing his price target from $60 down to $49. The 18.3% decline to his price target implies about 8.5% downside to the stock. While not a massive loss, it's surely not what investors want to see after an already difficult year. According to Konik's survey work, Nike is losing market share to Adidas in both the U.S. and in Europe at a growing pace. He cites running as an area where this market share erosion is quite notable, whereas Poser pointed to a weakening grip in the basketball category for Nike. Most notable from his research? Konik says Nike has just 35 shoes in the top 60, vs. 52 last year. Even more telling is Adidas, though, which has 24 shoes in the top 60, vs. just 2 last year.